Why, when, and how should social workers share pieces of their lives with the public? In today's world of Snapchat, Instagram, Facebook, and countless other social networking outlets, it's easy to see the negative in sharing. "In some ways, yes, we now live in a society with too much self-disclosure," says Elana Premack Sandler, LCSW, MPH, author of the "Promoting Hope, Preventing Suicide" blog on Psychology Today. "Do we really need (or want) to know the level of detail that acquaintances share via social media? All of those pictures of people's dinners and check-ins are self-disclosures, peeks into people's intimate lives that we never had before." However, as unnecessarily detailed as much of what is presented on individuals' profiles may seem, it's not all snaps of meatloaf. There can be insight, vulnerability, and support in posting. There can be value. "We now live in a society that, thanks to social media, has lower walls, meaning that we have more access to each other and to the true experiences of other people. I think this is a good thing and allows for more connection and potentially more authenticity between people," Premack Sandler adds. The question, then, is how does an individual contribute to that connection and authenticity without offering too much? What is the measure of worth? For a social worker, the question of how and when to self-disclose is particularly complex. He or she must consider both personal and professional impact, as well as setting. There is a significant difference, for instance, between private and public self-disclosure. In social work, private self-disclosure refers to the act of a professional sharing in a clinical setting. "In our definition," says Nanci Ginty Butler, LICSW, senior clinician and coordinator of program development for the Riverside Trauma Center in Needham, MA, "private self-disclosure is when a social worker reveals personal information about him or herself within the context of a therapeutic relationship with client(s). It can include the intentional sharing of details about oneself (e.g., sharing a personal story) or unintentional (e.g., wearing jewelry that signifies a religious affiliation). "Private self-disclosure can also include situations in which the social worker talks about their feelings about a client," she notes. Choosing to intentionally self-disclose in a professional setting can be a difficult and multifaceted decision. "In a one-on-one or traditional clinical situation, the rule should always be, 'Am I thinking about self-disclosure to benefit myself or because I see it as having benefit to the client?'" Premack Sandler says. While disclosure can build trust and rapport with a client, a social worker should never share simply for the sake of sharing or because providing such information will make the social worker feel improved in some way. Disclosure, particularly private self-disclosure, must always be framed in terms of the client's well-being. While there are similarities, public self-disclosure differs significantly from private self-disclosure in several ways. "Public self-disclosure involves a social worker revealing personal information about themselves outside of the therapeutic relationship," Ginty Butler explains. She says examples include "sharing information online in social media, on television, or writing publicly about one's personal life. "Participating in public events is also a form of public self-disclosure," she continues. "Public self-disclosure is a conscious choice to share information in a public forum where it might be seen or read by clients, or anyone, that the social worker works with in a professional capacity." Though public self-disclosure releases information on a larger level than private self-disclosure, the question a social worker must ask him/herself before choosing to disclose is the same, Premack Sandler says. "As a professional social worker, you want to think about the impact of your self-disclosure on other people. I think there can be tremendous benefit to social workers disclosing, but knowledge of your personal experience will impact how you are perceived. "For example," she says, "if you work with people who struggle with suicidal thoughts, it could be beneficial for them to know that you too struggled. Or, they could feel like you are not able to be objective about their experience because of your own experience. It's a very personal decision, not one to be taken lightly." That being said, one can never fully know how an audience or, more accurately, the individuals within that audience will react to public self-disclosure. There is less of a personal connection prior to sharing. "When I share personal information with my clients, it's because I think it will be useful to them therapeutically," says Carla Naumburg, PhD, LICSW, an author and therapist who provides support, education, and psychotherapy to parents in her private practice. "Any personal disclosure that happens in session is based entirely on my formulation and understanding of my clients and what they need. "My public self-disclosures are based on what I want them to know, or what I think my readers want to know," she notes of the difference. "It's my best guess, but at the end of the day, it's coming from my experience as opposed to my readers' experiences. There is just no way for me to know, or address, all of their individual concerns." As Ginty Butler indicated, there are many ways for a social worker to publicly self-disclose. Though there exists some overlap, each of the individuals Social Work Today speaks with shares pieces of themselves in varying ways. For example, Ginty Butler shared her story on television. "In April of 2015, I was a newish mother who had been diagnosed with depression six months prior," she describes. I was scrolling through my Facebook feed and came across a post by a local news show asking to hear from people diagnosed with depression and interested in reducing stigma. I had just come to the realization that I had been suffering needlessly for the past few years because I didn't realize I was struggling with depression. "Particularly, as a social worker who had worked in adolescent and family mental health for the previous 15 years, I was shocked that I had missed my own symptoms. I wondered how many others were experiencing depression too, without even realizing it. This [the television show] struck me as an opportunity to share my story in a way that might help others, to pay it forward in a sense." After some conversations with the producers to confirm that the show would represent the topic and her story appropriately, Ginty Butler and her husband signed on to be a part of it. Alternately, both Naumburg and Premack Sandler disclose through writing. "Writing has always been an important part of my life," Naumburg says, "from my very first childhood journal. Every time I am struggling to understand an important change or challenge in my life, I write about it, in either a personal, academic, or professional format. "Parenting is the most important, and most challenging, work of my life, so it made sense for me to write about it. In addition, I believe deeply in the concepts and practices of mindful parenting, and I wanted to share them with other folks in a casual, relatable way," she adds. Naumburg's writing incorporates stories about her parenting, as well as information on mindfulness and its role in raising children. Most recently, Naumburg began contributing to "Mindful Mama," a podcast created by Hunter Clarke-Fields, MSAE, RYT. "Mindful parenting was, and continues to be, at the intersection of my personal and professional life," Naumburg says. "When I share personal stories, it's important to me that they reflect my perspective and experience, as opposed to telling someone else's story." Premack Sandler, on the other hand, did not set out to self-disclose when she began writing. "I wrote for several months before deciding to self-disclose," she recalls. "It was a very intentional decision, and I truly struggled with whether I was doing the right thing for myself, my family, and those close to my family." Premack Sandler is a suicide survivor, having lost a loved one to suicide. She shares her experiences in her blog, though they are not a constant focal point. Premack Sandler says that choosing to disclose in this way has allowed her to open up in other mediums, as well. "Writing has led me to be more of an activist and has led to other public self-disclosures, such as being interviewed for NPR and participating in charity events as a suicide survivor." Other methods of self-disclosure include personalized performance, book authorship, political activity, and social media interaction. The choice to self-disclose and in what medium was made by each of the above individuals differently, and there is no one way for a social worker to make that decision. However, there are a number of things that every professional should take into account. For one, what are the risks and benefits of public self-disclosure? What may happen as a result of this sharing? "Once the information is out there, you can't take it back," Premack Sandler says. Naumburg agrees, adding, "In this age of internet publishing and social media, it is important to remember that once you publish something, you lose control of it. You lose control of who sees it, who shares it, and how often it might be brought back into the public eye." For Naumburg, this means that she risks impacting the therapeutic relationship she has with clients, as well as the perception potential clients may have of her. "On a personal level," she says, "at some point my children or someone else in my life might be unhappy with what I have written. I try hard to stay focused on my own story and my own experiences with parenting (as opposed to sharing my children's stories), but sometimes the two are difficult to tease apart." She recommends having a clear understanding of the varying consequences from the start. "The risks vary, depending on the details of the disclosure," she notes. "For example, social workers who self-disclose while working in a public agency might have different possible risks than those working for a private agency or those who are in private practice." "If they are working for an agency or clinic," she continues, "[social workers] should discuss their plans with their supervisors or bosses, or other interested parties." • What kind of social work are they doing, and how might a disclosure impact their work? • What is the extent to which the social worker is representing the social work profession within the context of the disclosure? • How much should be clarified about one's professional role as a social worker within the disclosure? • What might be the impact on one's family members and close friends? 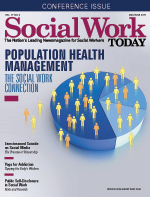 • What is the social worker's motivation? It may be that the answers to these questions are more negative than positive. And in that case, one should not self-disclose. But for many, the opposite has proven true. Public self-disclosure has led to a powerful and positive impact. "It has turned out to mean a lot to people to know that I am coming from a personal place on the issues of suicide, suicide prevention, and grief and loss," Premack Sandler reflects. "My experience has a different relevance and resonance—not greater or less—but a different timbre, because I balance a personal experience with professional training and knowledge. I hope that I will be a voice that can be heard and that I can amplify the voices of other people who have survived suicide loss." Ginty Butler feels similarly. "I think speaking out publicly about mental health issues reduces stigma and shame and leads to a greater understanding and acceptance of these issues in our culture. I saw that happen on a smaller level in my workplace; it opened up several conversations about mental health issues among my colleagues and myself and promoted a greater sense of openness and comfort for everyone. "In terms of impact, personally," she continues, "it was empowering to go public with my diagnosis, and I felt grateful that I could help others by my actions. It definitely contributed to my own recovery in that way." Once the decision to disclose is made, social workers should weigh the pros and cons of each possible method, taking into account the mode that they are best able to communicate. "Social workers should consider what medium will allow them to reach the people who will most benefit from their disclosure or story. Writing, specifically for an audience composed of laypeople and professionals, allowed me to tell a complicated story and address the nuances, as well as to allow for the story to unfold over time," Premack Sandler says. For more clarity on method, Naumburg suggests circling back to understanding one's motivation. "I think the first step in public self-disclosure is figuring out what their goal is. Why are they choosing to go public with their story? Who are they hoping to reach? What are they hoping to accomplish? If the method isn't immediately clear to them—as it was for me—then getting some clarity on these questions will help them figure out what makes sense," she says. Once confident about the intention, the possible impact, and the method of self-disclosure, a social worker can move forward. Ideally, once he or she does, positive things will come from it—for the professional and the community receiving the information, as it did for Ginty Butler. "When more people speak out," she says, "it can lead to greater acceptance in the workplace and personal life."